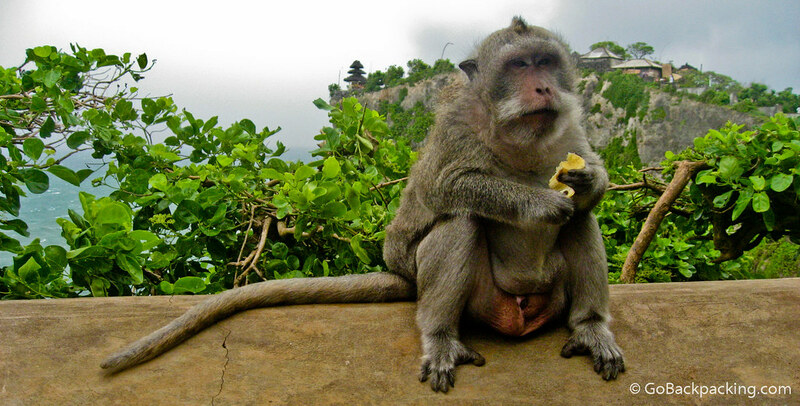 Indonesia was the first Asian country I've ever visited, and I spent most of my time on the island of Bali. Feeding monkeys bananas is a popular tourist activity, and I caught this Bali monkey noshing on one while perched on a wall with a clifftop temple in the background. The photo was taken right before a storm blew through and cut short our time walking around the seaside complex. Those monkeys are so greedy! :P One climbed up my dress and snatched the whole bag of nuts in two seconds!